Today is the day come find us at our WickED temporary collective / settlement. .
We have already been full in the throws of our festival experience this year and are very happy about it. For this weekend’s antics we have been creating a temporary settlement, transforming the Forman’s Yard; the building, imaginings and exchanges have already been flowing with a group of inspirational, diverse artists. . . .becoming part of the collective, Yoruk. ‘Yörük will present an assemblage of spaces and actions considering the temporary, permanent, functional and suggestive nature of spaces and structures. Through a series of gatherings and intimate events within the yurt and the yard, ideas will be shared on settlement to form an evolving conversation on continuous walking, carrying, sharing and building. A yurt is an intimate space for performance discussion and events. A yard used as a temporary place of settlement. The loose parts that scatter the surface of the yard and the wild bushes that emerge from gaps and cracks along the floor will provide us with the possibilities to gather and make. These loose parts will be added to, reformed and experimented with. A boat becomes a curated rowing conversation throughout the festival weekend. Once in front of the metal gates, call out to us through a signal of choice and we will come and collect you. Expect to encounter structures, performance, mini-screen looped films, sound and participation. A journey exploring the sights, sounds and fabrics of the festivities, leading to a yard of discovery with a number of dwellings, a temporary settlement. A place of creative imaginings and discursive exchanges. Here we will use ancient clay, excavated from beneath London, to make forms inspired by our experience and conversations, contributing to the shared happenings that will shape the space and the community of Hackney WickED Festival. Starting at The White Building on Saturday at 1pm, we start our venture round the studios, workshops, galleries and waterways. Finally arriving at Yörük at Forman’s Smokehouse yard, for our clay making. Or to be found at the canal side of Yörük all day Sunday, 12-6pm for drop in clay times. 2 pm Opportunity discussion with isik.knutsdotter. An event exploring lingering possibilities, where the word ‘opportunity’ has been exhausted and the word ‘community’ is being maltreated. We have arrived at a landscape where language needs re-growth and communal seeding. Join us in the yurt for 1 ½ hour of exploration. Booking required, please email isik.knutsdotter@gmail.com or find us in the Yard. Rowing conversations on the Lea: All day. An opportunity to converse, present and share ideas in the roles of passenger and rower through short trips on the canal – come to the yard to sign up for your trip. All day: Gaia Gallery Boat Moored at the canal side of our yard. ‘A Barge, Some London Clay and studio tour’ facilitated by Community Releaf will arrive to fire clay made in workshop but you are welcome to join whenever. 2pm Rhythm Analysis experimental sound concert with Paul Lorenz isik.knutsdotter and invited musicians. Paul has created scores for concert based on interpretations of a series of rhythm studies conducted through drawing. 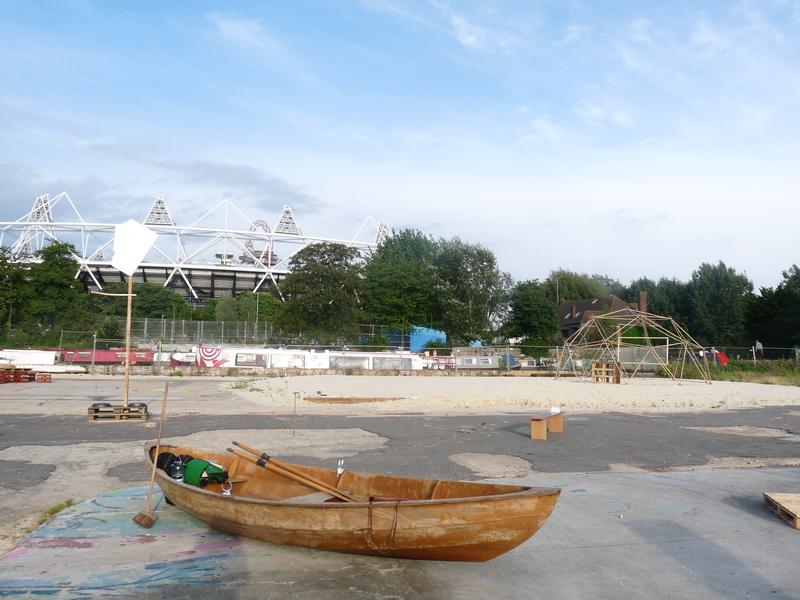 occuTRI on the Rowing Boat: Sign up to participate at the site. Dusk on Sunday evening Film Screening of Alberto Balaz’s short film – The Inner Valley. This film emerges from the need to explore questions about fertility, life, death, nature and the mother figure. The film was shot on location during a period of deep conflict on an island, in Buenos Aires. Over the past four years, those living on the island have been isolated and threatened, and properties have been lost and burned as private institutions build residential developments in their land. The character Geronimo is one of the last residents in the island in a landscape that has already been destroyed. For yörük, isik.knutsdotter are inviting participants to collaborate, observe and temporarily settle with them to carefully explore avenues of permanency and continuous motion, with rest points for discussion, thought and making. The settlement will be used to initiate a series of rhythm studies using performance, sound and walking. These studies will form collaborative actions throughout the weekend to examine ideas of architecture, people and city. Land and Elasticity. A series of sound experiences will also take place in the yurt throughout the weekend. 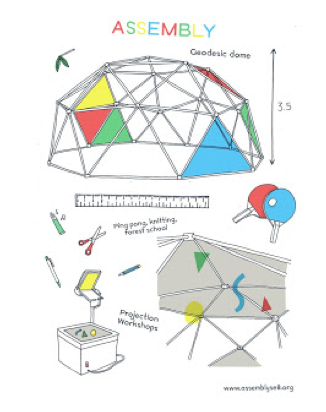 Jack will be building objects and structures that are informed by, or are reactions to the structures, networks, misunderstanding and cooperation that happen whilst organising festivals, groups, people and objects. Expect hand-held sculpture poles, seating, tables, screens, barriers and canopies. Land/ Sea/ Water/ People: Miniature groupings. For yörük Sadie will be facilitating others involvement in creating structures and collaborations to explore this site of wilderness in the Wick. They will repeat and come to a point, through the weekend, with participants using left possessions and found matter to find new communal forms and actions over land and water. Natasha Bird will be building site-specific structures using reclaimed materials, which can be altered and adjusted by visitors to the Yard. She will also be working with other artists to create spaces that invite different uses – such as discussion and performance. Or to be found at the canal side of Yörük all day Sunday, 12-6pm. occuTRI is an exploration of trinity (the state of being threefold or triple) during the occupation of domestic space, through lived politics. The occuTRI project began by documenting the daily actions and installations of an east London Victorian flat inhabited via Hackney council’s rent assured scheme. occuTRI is of unknown duration and uncertain of its future. occuTRI utilise performance, film, sound and installation to articulate and navigate the shifting politics and experiences of daily life. 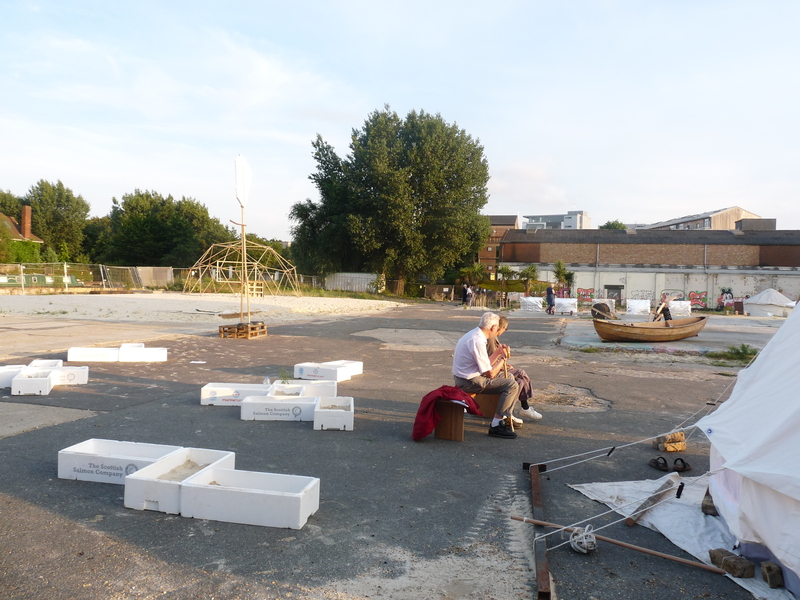 For Hackney WickED occuTRI will be making small performative actions for audiences on a small rowing boat. The act of rowing & position on the canal will set to explore how we operate as a trinity, whilst responding to the YÖRÜK themes of holding & carrying, permanency, arrival & departure and the fragility of our times. Timothy Cresswell’s interest in spherical geometry has been a continuing exploration starting with his early discovery of the regular solids at school. Through out the years he has been working on what he has come to call the ‘Primal Forms’ series, realising them through, construction and carving in three dimensions gives him a deeper understanding of their nature. Timothy feels the impulsive need to generate these forms and hours are spent honing them in order to achieve their geometric subtleties. Over the years Timothy has made hundreds of these hand sculpted forms. They are formed from integral interactions and intersections of waves, spirals and orbits. The subtle geometry of these Primal Forms will be rolled out on Saturday and Sunday in a live ongoing exploration, where participation will be invited. A bubble floats up from Deptford and lands gently on Forman’s Yard as part of Hackney WickED Festival. Bringing with it the collective skills, and practises of a craft led group of designers, makers, bakers and do-ers called AssemblySE8. 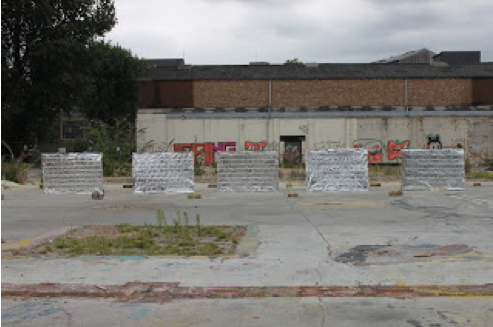 The collective live in Deptford’s historical Tidemill primary school, from where they actively involve the local community in gardening, workshops, cooking, sport clubs, films and play. For one weekend only, we will transport our collective practices to the Hackney Wicked Festival in an aim to inspire, entertain and give an insight into the activity that takes place on our site. Join us on a journey exploring the sights, sounds and fabrics of the festivities, leading to a yard of discovery with a number of dwellings, a temporary settlement; a place of creative imaginings and discursive exchanges. 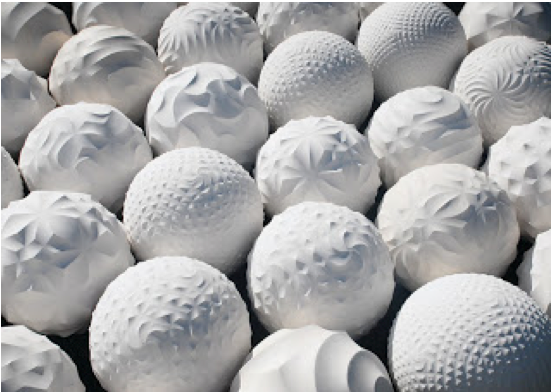 Here we will use ancient clay, excavated from beneath London, to make forms inspired by our experience and conversations, contributing to the shared happenings that will shape the space and the community of Hackney WickED Festival. Join us at the White Building on Saturday 17th of August at 1 pm to start our venture round the studios, workshops, galleries and waterways, leading to Forman’s Smoke House Yard, for our clay making. Or find us at the yard all day Sunday, 12-6pm.